"Exhaust"-ed by choices. Need your knowledge! 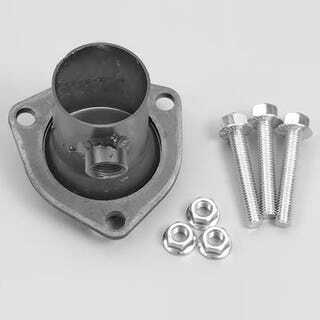 Ball and Socket reducer. Good idea? I’m getting ready to modify a set of Jeep headers to fit my AMC Eagle. I’m already a welder so one hurdle down. Have a TIG welder showing up Monday, so that’s another problem solved. Have 309 rods and Argon gas. But I don’t really know anything about exhaust systems. I’ll be cutting off the bottom of the header and changing the angle of the last pipe section to point away from the engine by about 45 degrees to clear an engine bracket that Jeeps don’t have. I need to know about FLANGES and how systems connect together. It currently has a 2 bolt flat flange that leaves a little of the 2.25" OD pipe sticking through. My exhaust pipe is 2" OD and had the end cut right off due to clearance and being seized with 29 years of rust. The header came with a little sintered donut thing which is not how the factory setup worked. The factory system seemed to just crush the exhaust pipe up into the flared base of the original cast manifold. What are my options here? Keeping in mind I’ll have 2 virgin ends to work with. Should I weld on 2 or 3 hole flanges? I’ve read 3 hole seal better. Do I need a gasket? How does this donut thing work? Should I use a ball a socket flange? Does there need to be flex at that point? Should I use a reducer? I know nothing! Tell me all the things!